Volunteering in the Galapagos Islands offers an incredible opportunity to get to know this unique archipelago as well as to contribute to their preservation against the constant threat of invasive species that can displace local flora and destroy the food supply of local fauna. We offer the opportunity to volunteer with a local hacienda - rooting out invasive species, contributing to sustainable agriculture projects, and working with children at a local school. You can stay in the Galapagos for a maximum of 90 days - plenty of time to volunteer and to travel around and explore this precious environment. "Volunteering at the hacienda was something I will never forget for the sharing with other volunteers, the dedicated and fun staff, and of course the chance to be working with like-minded people on preserving this incredible environment." 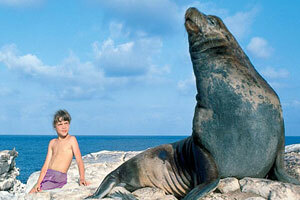 The Galapagos islands - Climate and Seasons . . . The climate in the Galapagos Islands broadly follows that of the Pacific coast in general. The rainy season is from January to April, but is rarely enough to seriously disrupt activities and excursions. The islands are at their greenest at this time. The	rest	of	the	year it is mostly dry. Temperatures vary between 27C - 32C in the winter to 21C - 26C in the drier months of the summer. Water temperatures vary between 21C - 26C in the winter down to 18C to 21C in the summer. We collaborate with a hacienda on the island of San Cristóbal, located in the central highlands about 20 minutes from the main town of Baquerizo Moreno. The hacienda receives up to 21 volunteers maximum througout the year and there is always plenty of work to do!